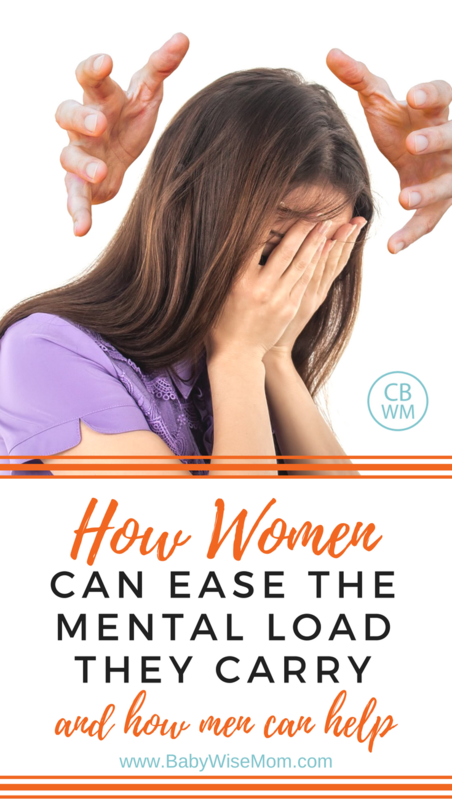 In this post: How to ease the mental load. How men and women can lift family burdens and keep the load more equitable. There are days I feel completely over-burdened. These are days I feel like if one more thing pops up, I will surely melt into a puddle of tears on the floor. Those are days that a glass of spilled milk seems like a 1,000 pound brick has been placed on my back. My brain feels like it will explode and I cannot take one more piece of information into it! I cannot possibly take another problem to solve or task to do. This is the impact of the mental load growing too large. The “mental load” is every single thing you have to keep track of. It is the myriad of things that have to be kept track of for a family. We all have our daily “to-do” lists, and those can be long, overwhelming, and seemingly insurmountable. Even heavier and more overwhelming is the mental load we carry. All of those invisible tasks or things that can’t simply be checked off you have to keep track of in your mind. Add on top of that mental load a day filled with children who talk constantly and you just can’t take one more thing. You can’t even adequately track that mental load because you can’t even complete a sentence when you talk to yourself. You are constantly interrupted by a child; a child whom you love and whom you want to talk to and whom you want to take care of, but whose endless talking is significantly adding to your stress. A child who is so excited to tell you what she learned, or ask all of the questions that pop in her mind, or who needs a lot of help because she is just little. Now you have the load to carry while juggling the children. Men are more and more doing more in the home to help out. For the most part, gone are the days when a man gets home from work, sits down, and relaxes the night away. Men are coming home and jumping in. Men are helping out and are even happy and eager to help. They want to be more involved and they want to help their wives. This is such a great step! The next step is acknowledging “mental load” a woman carries and helping ease some of that mental load. Studies are showing that even women who work full time carry the brunt of the mental load. Women can get quite good at learning to balance and track all of these things. But when something comes along that is suddenly added to that load, it can be that straw that breaks the camel’s back. Even something as simple as Suzy coming home from school sad because she had a big fight with her friends at school can be enough to put a mother over the edge. It is no small thing to talk through a situation like this and carefully respond. A mom worries about her child and the pondering continues long past the time the conversation ends, often even through the night. What advice should she best give? What is the right thing to say? Did she say the right thing? How can she help heal her daughter’s broken heart? Then of course, the already present load of things to track start to feel like even more of a weight. How can she keep track of all of that while putting her mental focus into this new dilemma? When a woman asks for help with something, she doesn’t let go of that in her mind until the task is complete. So when she asks Dad to help Johnny with his homework, the fact that Johnny needs his homework done is still on her mind and being juggled as a “to-do” task in her brain until the homework is actually done. So let’s get the conversation going. 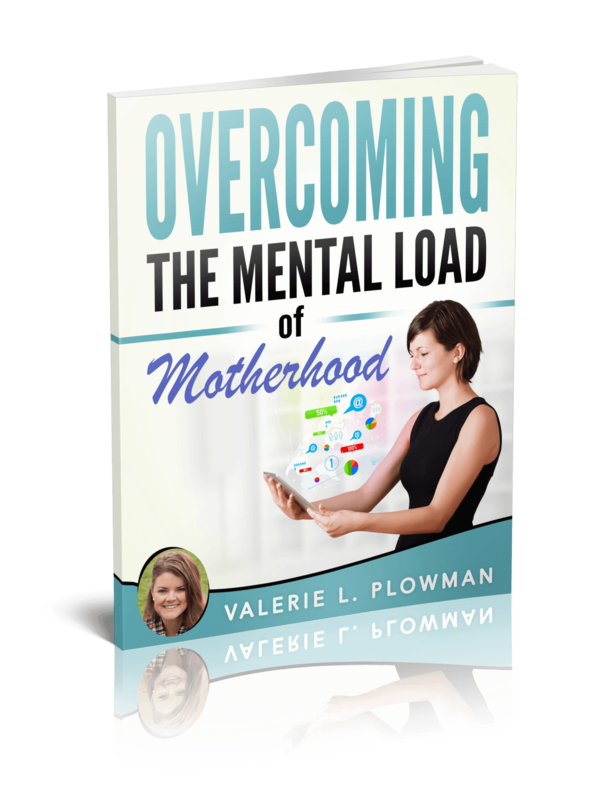 How can the mental load be eased? Avoid overscheduling the family. Do not let your children participate in more than you can keep track of and still maintain balance of that load in your head. Where possible, sign up for things with friends so carpooling can happen (and friends are usually great reminders to help you remember things you need to keep track of!). Vent when you need to. Sometimes you need to talk to someone and just get it all out. Let them know you are venting. Often, when we rattle off the list of things stressing us out, we realize it all isn’t a big deal. Be cautious with the ventint; you don’t want to be negative or pessimistic. But I do find it helpful to talk about things you are stressed about. Write down everything on your mind. Do a mind purge every once in a while. Sit down and write down every single thing you are thinking of that is on your “to-do” list. Everything. Then, find a way to track it. Get an app. Keep a simple list. Get a planner. Write things on a calendar. Put reminders in your phone. Whatever works for you, do it. Get those things off your brain. Bonus tip, when you have this list completed, highlight or star things that can be done in 5-10 minutes and knock them out right then. Removing things from your brain helps ease stress significantly. Ask your spouse to take something over. If there is something your spouse can take over, ask him to. Do be aware and sympathetic to any mental load he may bare. You aren’t the only one with worries, but studies show women carry the vast bulk, so in most cases, it is perfectly just to seek some balance. You must, however, be willing to give up anything you delegate. Your spouse may not take over a task in the same way you would do it. You have to walk away and let him do it his way. It is not relieving your mental load if you micromanage it. That actually adds to your mental load because now you have the task of overseeing. Do not get mad when your husband takes initiative and does something without asking you. If he goes grocery shopping and buys the wrong brand of peanut butter, just be grateful he bought the peanut butter. If he decides to make dinner without checking with you to see what should be made, do not get upset. Have fair and clear expectations. Look at the things each of you is over and try to get things in a reasonable place. If both of you work, the home life load can reasonably more even. If one person works and the other stays home, it is reasonable that the person staying home will have more of the mental load to carry than the one working outside the home. Also, talk about what you are hoping for. Don’t stomp around the house mad that he isn’t reading your mind. Communicate your needs. Be willing to accept help as it is. If your husband cleans the bathroom but doesn’t do it your way, accept it and move on. The bathroom will get dirty all over again and need to be cleaned soon, so you can clean it then. Do something every once in a while that distracts your mind. A “To-Do” list is never finished. You will always have more you can do. Find something that clears your mind so you can’t think of anything on the list. My way to do this is to read a book. While I am reading, I am only focused on the book. I am not worried about my list. It rests my brain and allows me to recharge mentally. You might do this through something like a girls night out, a date night, Sudoku, or a movie. A note to men. Many men, to at least some extent, wait to be asked to do something. They are happy to help, but they do not do so without their wife or partner explicitly saying, “Will you please go change that diaper that is barely hanging on the toddler?” She asks this question while she is trying to help the 6 year old with homework and make dinner at the same time. You agree to change the diaper and do it. You probably feel great and pat yourself on the back for being so helpful. Let me bring you in on a secret. It would have been nicer for you to have taken note of the dirty diaper and gone and changed it yourself. That is what women are hoping for. Initiative. Noticing what is going on around you and responding appropriately. While you are patting yourself on the back for being so helpful, your wife is wondering why she has to ask a child’s father to change a diaper. 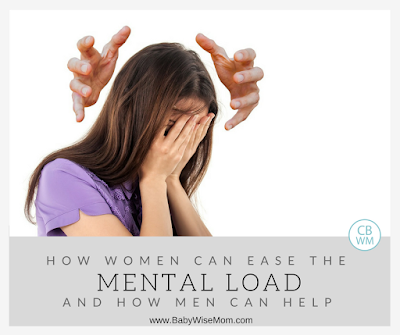 Here are some ways you can help ease the mental load your wife carries. Sit down and discuss the list of chores. What can you take over? What can be your thing, day after day, that she doesn’t have to worry about any more? Ask your wife what things stress her out and see if you can take over any of that. When my husband and I first got married, I tracked all of the bills and finances. Once I had two children, this came to be too much for me. My husband took over tracking bills and the budget so that I could remove that mental load off my brain. Take care of everything for a while so you understand it. We can’t fully appreciate and understand what a person is dealing with until we experience it. Send the wife away for several days and see what it is like to track it all. Don’t just turn to technology to entertain the kids while she is gone. Get them to their events. Make sure their homework is done on time. Make sure their clothes and bedding are clean and they are showering. Make sure they have lunch money. Keep the baby on schedule and tweak it correctly if she is off. Make dinner. Sort through problems on your own. Many years ago, I injured my foot and could not walk well for at least a month. During that time, my husband went grocery shopping for me. He literally called me about once every five minutes to ask a question. There were all sorts of questions. He didn’t want to mess up, but it was exhausting! It is okay to figure things out on your own (and women, we have to be okay with things being done differently than we would do them in these cases). If you agree to do something she has asked you to do, do it in a timely manner. The reasons wives end up “nagging” you to do something is she is desperately trying to get that item out of her head. She can’t until you do it. If you can’t do it quickly, let her know, “I won’t get to this for about an hour (or a week).” Then she can reshuffle the things she is trying to track. Encourage your wife. Encourage her to take breaks. Be grateful for the efforts she makes. The list above is just a snippet of the things a typical woman is trying to keep straight in her head day in and day out.This is a surface list, and it doesn’t even expand past the home. It doesn’t reach out to staying in contact with friends or taking a meal to someone in need. It doesn’t account for volunteering in the community or for any work the wife may be doing. Understanding the mental load, what it is, and how it impacts your life daily helps you understand why a seemingly small thing can feel like Mount Everest. It can help you better understand what tasks you can add to your plate, and it can help you delegate things out and accept the best others can give. It can help you on those days, that do come, when you feel completely overwhelmed, you can step back, empty your overcrowded brain, and reach out for help. Please stop referring to ” helping” when talking about dads’ work. Can’t you see this ends up being partof the problem? Most articles about child rearing are aimed at women, maybe we can change things by changing this. How about finally expecting dads to do their share of the work? It is not a gift or an additional help they graciously grant to women. How come a husband do grocery shopping ” for his wife”: doesn’t he eat as well?? There s a screaming need for a fresh framework around housework and care chores. If grocery shopping is typically my job, however, then when my husband goes grocery shopping, he is helping me. Just like if making the bed is typically his job each day, if I make the bed that day, I am helping him.